Let's start by creating a simple "Hello world" web service. When we create and run this web service , it will be run by a web browser. However, in real life, the true aim of web service can only be achieved if we can call it from some web application or a console application. Before further description, let me introduce the concept of proxy class to you. This class plays a third party role for interacting between a client and a server. It facilitates all the communication between the client and the server, be it connecting client to the server or passing parameters and methods to the server or returning results from the server. We should create a proxy as a first step to enable console application to call a web service. A utility named WSDL.exe is available in .NET to create proxies. This utility needs to know the WSDL which the proxy should use. 1. Choose Start >> Visual Studio.NET >> Visual Studio.NET Tools >> Visual Studio.NET Command Prompt to open the Visual Studio.NET command prompt. 2. Create a new directory for storing client projects. /l:CSindicates a proxy built in C Sharp Language. /out:HelloworldProxy.cs specifies the proxy name. In this case, it is HelloWorldProxy. http://localhost/TimeService/Hello.asmx?WSDL is the url which is description of the web service for which proxy class is being created. WSDL utility generates the source code of HelloWorldProxy.cs in result. This proxy file will contain a new definition for HelloWorld class that we developed in Listing 1.1. This class definition is different from the definition we have created before but our clients will use this definition. Instead of executing methods directly, it invokes the methods of original class (HelloWorld in this case). When you see the source code of this file, you will also notice two functions BeginGetMessage() and EndGetMessage(). These two functions have been created to facilitate calling the web services asynchronously. Since you have created a proxy class and compiled it, you no longer need to worry how this client application calls the web service or how methods and parameters are sent. The proxy class handles all the work in background. All you need to do for creating a console application client is: Create a proxy class and tell it the WSDL url of the web service to be accessed. 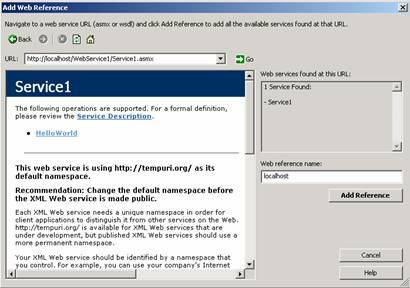 ASP.NET has made it an easy task for calling web service from a web application. Now this is only few clicks game. 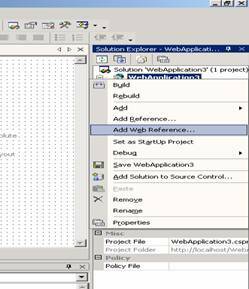 Follow these steps to call a web service from a web application. 2) Right click on project name as shown in window on right hand side. Select "Add Web Reference". A window like figure 2 below would be shown. 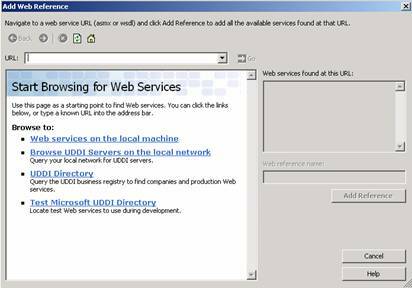 3) In "Web services on the local machine" portion, it would list down all the web services that you have created and executed on local machine. 4) Click on "Add reference" button. 5) You would need to do some changes in Page_Load method. 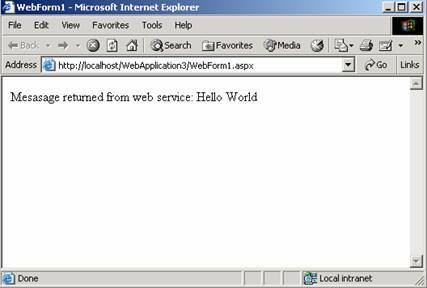 Where the name of web reference is "localhost" (See the project pane) and its function was named "HelloWorld". 6) Now, run the project to see the results from web service. As I said, SOAP is one level above than HTTP, this means an HTTP request would be generated after the SOAP request. Moreover, there are few header lines added to SOAP request in order to generate the HTTP request. The true aim of web service can only be achieved if we can call it from some web application or some other type of application. 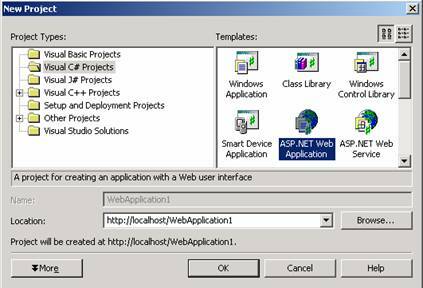 To create a console application as client of web service, you need to create Proxy class first. A proxy facilitates all the communication between the client and the server, be it connecting client to the server or passing parameters and methods to the server or returning results from the server. A utility named WSDL.exe is available in .NET to create proxies. To communicate between clients and web services, a protocol called SOAP (Simple object access protocol) is used. This protocol is higher in level than HTTP. HTTP request is generated to be sent to the web service.